Interesting title, huh? Let me explain. Many of you don't know this about me but I was once the "Queen of Chicken Wings". I actually owned a restaurant called Amazin Wings. My restaurant served over 30 different flavors of wings. They were the best, if I do say so myself. The reason for this blog title is because I feel about my kale the way that I felt about my chicken wings. I would never order wings at a restaurant because I was always disappointed. They never tasted as good as mine. Now I find myself going to Vegan or Vegetarian restaurants and being very reluctant about ordering the kale salad because I love MY kale and I'm afraid that I will be disappointed. I eat kale salad almost every day and I feel that I have mastered it. Below are a few of my favorites. Enjoy!!! What's your favorite kale salad???? Remember to Make it With Love!!! I'm a vegan and I want a burger. 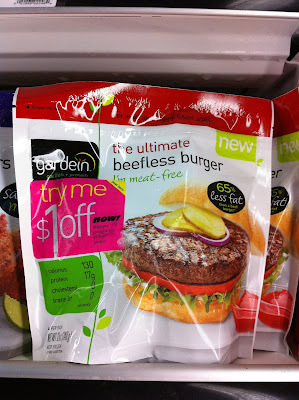 I have been anxiously awaiting the arrival of Gardein's Beefless Burger. I've seen a number of pictures and read many reviews on Twitter from my vegan friends about this burger. I even went as far as emailing the company to see when the burger was going to reach my area. They answered saying that it would be the end of June...OK, I'll wait. But in the mean time what do I do about my burger craving??? I tried a few vegan burgers. None really to my liking. I was putting all my faith in Gardein. Why you ask? Because they have not disappointed me yet with their meatless options. In my every day diet I try to maintain my high rawness, but sometimes a girl needs a piece of meat, fake meat that is. And this is one of those times where I needed a good vegan burger and I intended to hold out until this burger arrived to MD. Roots Market now has the burger!!!!! Let me tell you, I could not finish my lunch fast enough. Walked over to Roots and got my burgers!!!!! Surprisingly, I didn't eat a burger that day. I called my BFF, who was ending her 10 Raw Food Challenge, invited her over for some veggie burgers with all the fixins on Saturday. Saturday began with a workout and a trip to the farmers market...can't make a burger without fresh tomatoes. Also picked up some green tomatoes...Let the grilling begin. When I said all the fixins, I meant all the fixins. On this delectable burger is lettuce, tomato, onion, grilled green tomato, cheddar style Daiya cheese, and Vegenaise. And I mustn't forget the pickles that I made myself. All of this was sandwiched between an Ezekiel bun. When I say this burger was worth the wait, I mean it was worth the wait. It was substantial and full of flavor. It was everything that I had hoped it would be. Notice that I didn't even take my apron off to eat it. I ate the entire burger standing up. I truly had a moment with that there burger!!! And it didn't stop there. I had a burger for lunch today and another for dinner...Don't judge me :-). Tomorrow...smoothie for breakfast and kale salad for lunch. 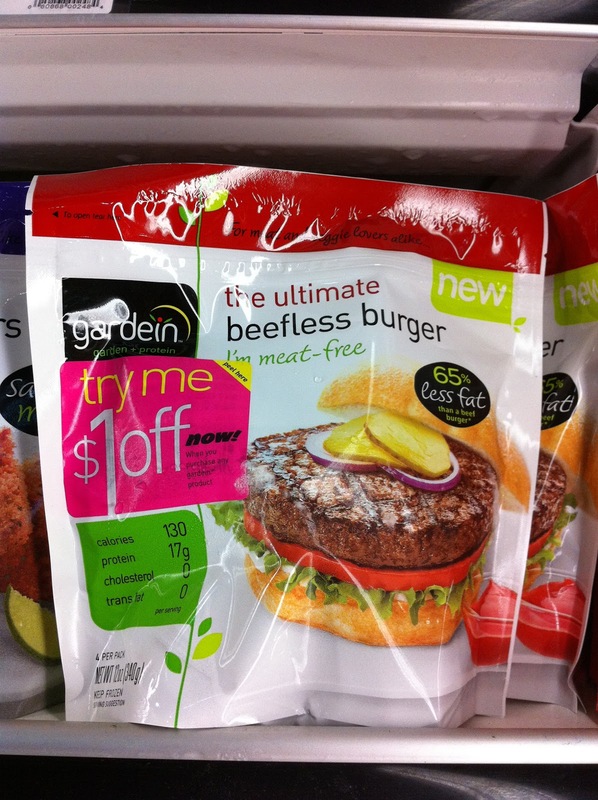 I think I can speak for vegans everywhere when I say, Thank you Gardein for your gratifying products! Yesterday 5 of my good friends and I went to one of my favorite vegan restaurants, Great Sage, for a 5 course raw dinner. The menu was "Flavors of the South West". We were all very excited about this experience because it was a first for all of us. I think it is safe to say that I was just a little more excited than they were because I frequent Great Sage often and I'm always asking them about putting more raw items on the menu. I was anxious to see what they had to offer us this night. Pardon the dark photos, the restaurant was dark and I used my iphone with flash. This course was delicious. The flax cracker was moist and flavorful, the mushroom ceviche's flavor was perfect, the chipotle cream and the macadamia swiss cheese both had great flavor...had us all wondering what they did to make it taste like this! All agreed that this was a great dish!! 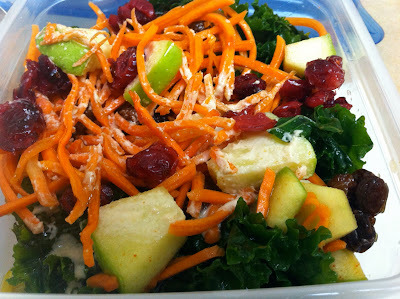 Ok, anyone that knows me, follows me on Twitter or is even my friend on Facebook, knows that I live and breath kale salad. I was interested to see what this salad was going to taste like. The menu did say "wilted kale". I wanted to know what "wilted kale" tasted like. I still don't know what "wilted kale" taste like. The dressing on the kale salad was flavorful, the fennel, watercress and avocado were nice. The candied pecans were also a nice touch. But, coming from someone who has studied and mastered the making of a kale salad, I was a little disappointed in this salad. The greens had not been massaged enough for my liking, if at all. Again, this is my opinion and I make kale salad every week. This salad reminded me of my very first kale salad. It was good, but after I figured out that you need to massage with olive oil a little sea salt and a whole lotta love...it became delicious!!!! I was a little skeptical about the puree, not a big fan of cold soups. This soup was bursting with flavor. You could really taste the sweetness of the corn in addition to garlic and onion. The bell pepper oil was delicious. This was a very hearty bowl of soup. None of us could finish the entire bowl. It was a bowl of creamy goodness!!! And to cleanse the palate...this was cold, fresh and delicious!!! 4TH COURSE...Jalapeno-pecan tacos with guacamole and sour cashew "cream"
This was the portion of the dinner that we all anticipated and it did not disappoint. The taco shells had great flavor with a little sweetness, the taco "meat" had great flavors of cumin and coriander. The sour cream and the guacamole blended perfectly. By this portion of the dinner we were all stuffed, but not too stuffed for me to finish both of my tacos! Double yummy! They fooled me with this one. I was expecting actual ice cream. This is macadamia nut and agave pureed together then frozen...different but good. Not sure if I would order this. The caramel and fudge were totally yummy. I must admit I was slightly disappointed with the dessert. Had the palate set for some cold creamy coconut milk like ice cream. I would have settled for the raw chocolate mousse that they serve because it is awesome!!!! All in all, it was a great night with great friends at one of my favorite places to enjoy a meal. The service was outstanding. The courses came out like clock work. Everyone had a great night!!! !